Glenmarie Gardens is an exclusive, low density enclave comprising 70 units of two and two-and-a-half storey bungalows, situated on freehold land in Glenmarie Section U1, which is conveniently accessible from the main highways and main roads serving the vicinity of Glenmarie. The development is split into two phases, Phase 1, consisting of 14 units, was launched on 26th November 2010, while the Phase 2 of the project will take off in the 1st Quarter of 2011. Construction works for 14 units of Phase 1 will commence in May 2011, and is due to be completed in September 2012. There are seven distinctive architectural designs in the Glenmarie Gardens project - Amaryllis, Bloomeria, Carlina, Dellania, Encillia, Firmiana and Gazania. The build-up area starts from 5,910sq ft and tops at 8,033sq ft, while the land area starts from 8,364sq ft and stretches up to 14,693sq ft. These homes are tagged from RM5,262,277 to RM8,156,888. 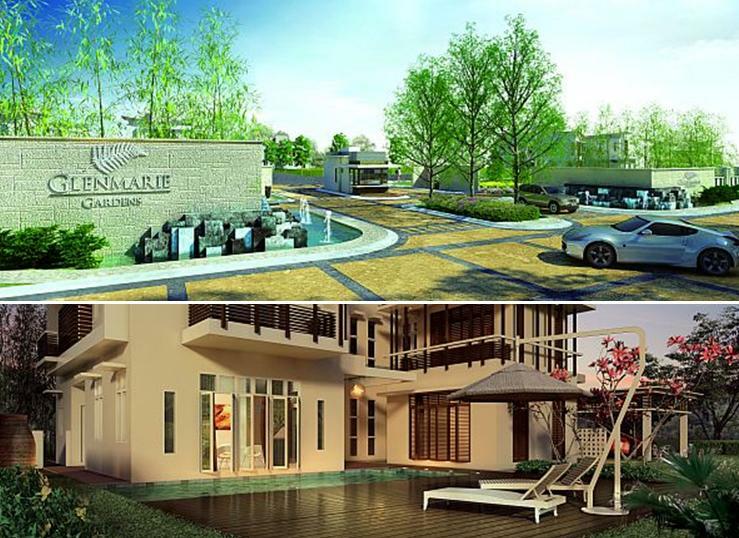 Glenmarie Properties takes pride in its property development’s involvement, covering residential development, commercial development and also the hospitality segment. Completed projects under Glenmarie Properties’ residential projects’ portfolio include Glenmarie Court, Glenhill Saujana, Glenmarie Residences and Glenpark, all within Glenmarie and Shah Alam vicinity. The commercial development’s completed projects include the Accentra Glenmarie and Glenmarie Industrial Park. At a glimpse in the year 2010, several lifestyle projects have been planned and in May 2010, 48 units of townhouses were launched at Mutiara Tropicana. Glenmarie Properties recently launched 17 commercial units of Glenpark at Seksyen U1, Shah Alam in October 2010. The Glenpark shoplots’ project under Horsedale Develeopment Berhad, is built on a 0.62 acre land next to the Glenpark residential area and is due for completion in October, 2013. On a different note, Glenmarie Properties’ involvement in the hospitality segment include the Holiday Inn KL Glenmarie in Shah Alam, set amidst a 350-acre of tropical greenery, overlooking two 18 hole world class golf courses of the Glenmarie Golf & Country Club. In the northern region, lay Rebak Island Resort in Pulau Langkawi, a 5-star accommodation with pristine and secluded beaches. Situated on the East Coast in Terengganu, is Lake Kenyir Resort & Spa, featuring a world-class resort fringing the country’s biggest lake, surrounded by the beautifully preserved tropical rainforest. Contact 1800-88-8580 or email raja.azahatuluyun@glenmarieproperties.com for more information or a private presentation on Glenmarie Gardens. EASTERN & Oriental Bhd (E&O) says its unbilled property sales as at September 30 have surpassed peak levels recorded in the year ended March 2008. E&O, listed on Bursa Malaysia's main board, locked in unbilled property sales of RM604.8 million during the period compared to RM203.7 million registered as at March 31 2008. This was due to stronger buying sentiments in the high-end segment where it has a niche, the company said in a statement yesterday. This helped E&O to achieve a net profit of RM17.9 million for the six-month period to September this year, matching the performance of a year ago. E&O executive director Eric Chan said the profit from its strong unbilled sales position will provide a robust base for an enhanced future performance. "In addition to this, the recent reopening of Lone Pine Hotel, E&O's boutique resort at Batu Ferringhi, and the upcoming launch of Straits Quay, Penang's first seafront retail mall, are expected to positively impact the group upon achieving targeted operational levels." Chan said E&O was on a strong platform to capitalise on future growth opportunities and is expanding in all segments. "We are set to execute a portfolio of current and near-future projects with a total GDV (gross development value) of RM4 billion," he added. E&O is positive about its hospitality arm, spearheaded by its two heritage hotels in Penang, the E&O Hotel and Lone Pine Hotel. The company has recently increased its stake in The Delicious Group to 100 per cent and is embarking on an expansion drive locally and regionally. Plans are under way to strengthen the brand presence of the F&B chain, which currently operates seven outlets in Kuala Lumpur.